Beautifully engraved Specimen from the General Industrial Alcohol Corporation. 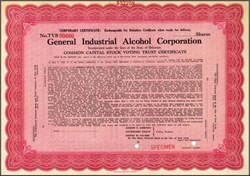 This historic document was printed by the American Banknote Company. The company became Oldetyme Distillers Company in 1933 which became Delendo Corporation in 1943.